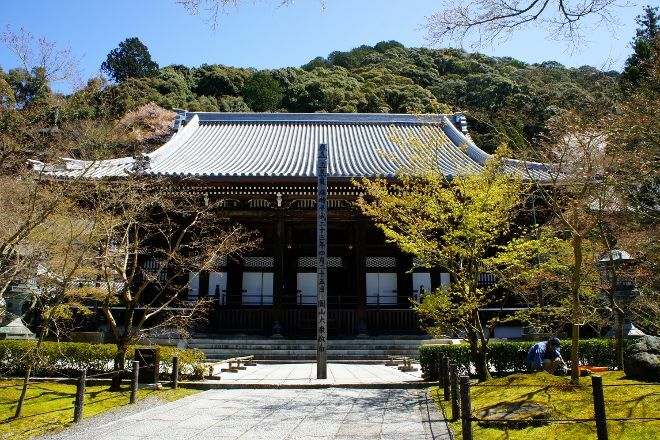 Eikando Zenrinji Temple provides a contemplative natural environment for the worshippers, monks, and tourists who pay visits to meditate and offer daily prayers. This Buddhist temple of the Jodu-shu sect dates back to the turn of the 10th century and has been gradually built and rebuilt over the centuries. Climb the temple's tower to appreciate the best views of landscaped raked-sand gardens and Japanese maple trees. Don't miss the famous Amida Buddha statue, which allegedly looked over its shoulder at a slow-moving monk during a ritual in 1082 and stayed in that position ever since. Make Eikando Zenrinji Temple a part of your Kyoto vacation plans using our Kyoto visit planner. This year the summer is too hot or typhoon, wasn't like autumn leaves. I would do best in number of leaves. I was at the end of 11 months 1 week early peak was. But the weather was good Maple contrast between the sky was. As long as the mention of going to Kyoto to appreciate the maple, the network push recommended must go to the place is the eternal Observation Hall, but the usual door ticket as long as 600 yuan, one to Maple leaf period on the double to 1000 yuan, the old reality is really full of expensive, but said really inside the maple leaves really a lot, to the intensity of the same as the east and the other, want to see the full maple leaf is really can come here, But a person is not very like, because a person is more like the building with the maple leaf, in addition to the inside also has the silver apricot can see. People who buy Kyoto underground iron, Bus day coupon or 2nd voucher can be presented at the time of ticket purchase, because it is possible to discount 100 yuan, but it is best to go to the website before the development of the site to see if the benefits have changed. The red leaf in night is amazing. It’s a must see in Kyoto if you had the chance. I would recommend this over any other night attraction. The only problem I have here is it is too crowded. That is the proof of how amazing the view is. Try to be there early as the line get pretty long after 4:30 pm (open at 5:30). Make sure your phone is fully charged as it take very long before you can enter the area. I love this temple although it is not in spring with cherry and not in autumn with foliage. It still has fully charm. Gardens and buildings are very beautiful. Treasures are valuable and rare.